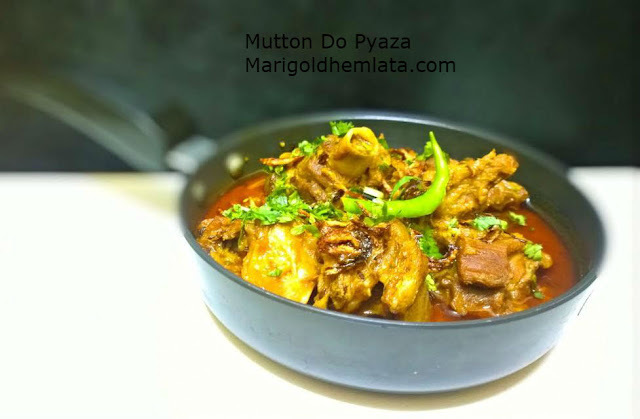 Famous mutton do pyiaza recipe is prepared with a large amount of onions. Mutton Do Pyiaza cooked with fresh goat meat, onion, curd, dry and whole spices. Heat oil and golden fry the sliced onion keep aside. add cumin seeds, green and black cardamom, cinnamon, cloves as they pops add mutton sear the mutton for 10 minutes then keep out the mutton pieces. Add chopped onion fry till golden, saute the ginger, garlic paste. Now add dry spices , turmeric, red chili, cumin powder and coriander powder, 1 /2 cup water and cook the spices till oil separates. Add mutton, fried onion and curd stir continuously and cook till all the water evaporates. Now add 2 glass water and cook for 15 minutes on slow flame. Add Garam Masala . Switch off the gas, garnish with green chili and coriander leaves serve with chapati or paratha . NOTE -----Add the spices as per choice. If you want gravy increase the quantity of water.